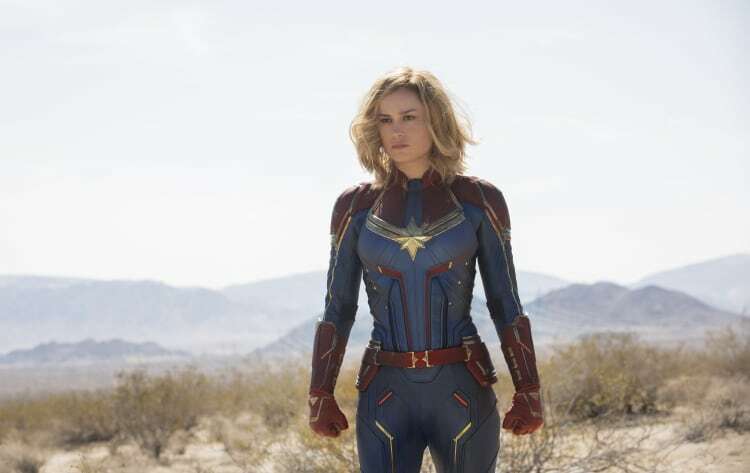 On March 8, 2019, Marvel fans and movie lovers will welcome — for the first time — Captain Marvel to the big screen. 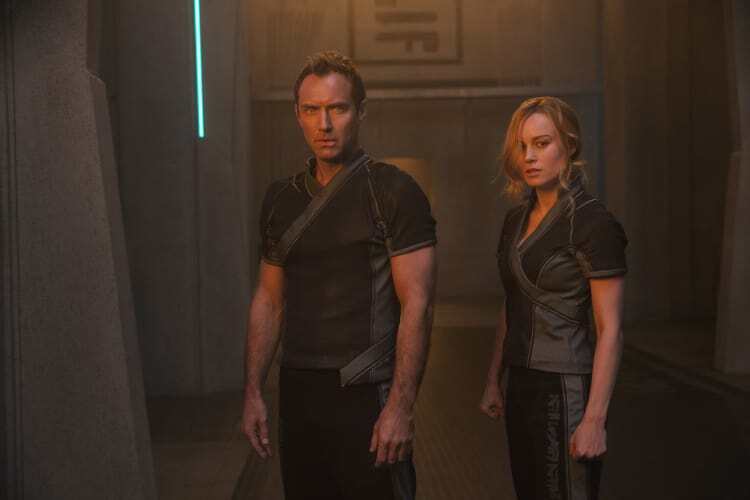 The film will mark Marvel’s first female-led release, starring Brie Larson. 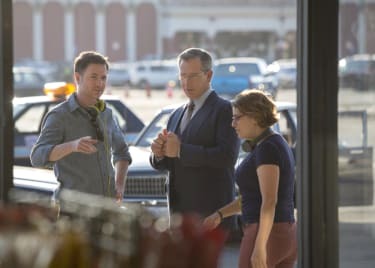 We sat down with Larson on-set to discuss her role, the character’s significance, and the physical and emotional dedication to bring the powerful hero to life. Whose idea was it for you to push a jeep up a hill? It wasn’t as hard as I thought, which was crazy. It felt super satisfying. I felt really crazy after that. I had never lifted weights or done things until this movie like that, and you get these crazy highs, and then you just kind of collapse onto the floor. Is there a particular sequence that required this type of training? I love it. It definitely makes things more complicated in certain ways, because I could be taking a lot more naps than I am. It’s really become a huge part of how I learned more about her and became her and embodied her was through that — was through discovering my own strength. Pretty amazing thing. Could you tell us a little about her personality, especially in this scene? Because she was being a little sassy, maybe has a little bit of ego to her — is that how you look at it? I mean, I think she has an ego, but in a healthy way. She doesn’t have an unrealistic expectation of herself. She just owns that she’s really good and really skilled, which feels good to play. She also has an incredible sense of humor and makes fun of herself, makes fun of other people, has no issue if someone makes fun of her. I will say that this character is probably the most dynamic character that I’ve ever played, like there’s the most range. I’ve had to go through every emotion possible with her, and a lot of this movie, although it has great comedy in it, there’s also real depth to it and emotion. I think the film will have a lot, which for me, is what I want. I want to see complicated female characters. I want to see myself, which is not a simple person. I surprise myself constantly by what’s happening and what’s coming up, so hopefully that’s what comes out on screen. How has the part challenged you as an actress? What are the things where you found yourself saying, “Oh, this is really testing my limits”? Well, the general answer is, just getting through a movie like this is a real challenge of everything — of mind, body and spirit, because it’s a long one. And because I added in the physical side of it, it’s like doing a triathlon or something. There are some days where I’m doing a fight sequence for three days, and then at the end of the third day, after I’ve been punching and kicking, then it’s like, ‘OK, now we’re going to do this one piece where you’re crying, and it’s emotional.’ And you’re like, ‘Whoa. This all feels crazy.’ And it moves so fast and there’s so much, and at a certain point, you just have to trust your instincts. 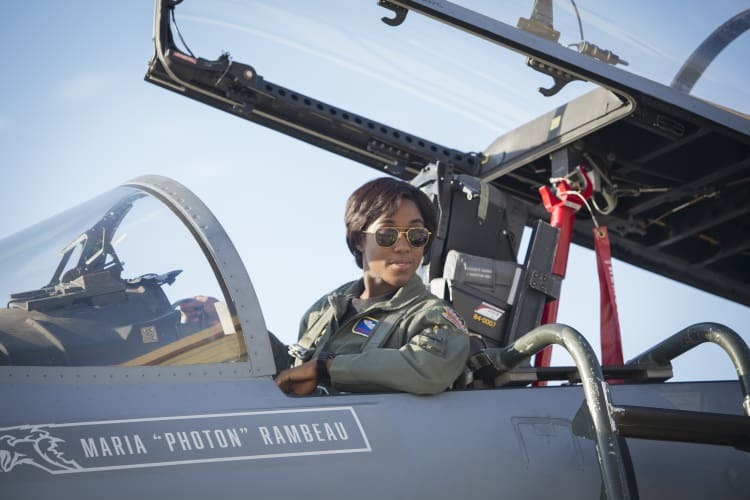 How has it felt to be the lead character in the first female-led Marvel movie? I don’t know. I don’t know how it’s any different, and to be honest, I don’t want it to feel different. Kind of over the like ‘first female blah blah blah’ and like ‘wow, maybe women can actually do the same things that dudes can do — what a crazy concept,’ you know what I mean? I feel like the more we talk about it, the more we perpetuate the myth that it’s an impossible task. It’s like no, if it wasn’t like that before, it’s because it was wrong. That was just wrong. Now we’re just doing what’s natural. What do you want the audience to come away with? I feel really firmly that art is made to be enjoyed and interpreted, and you get what you need out of it. Art isn’t made to be processed and labeled and organized in the way that we do it now. I even have a hard time with the idea of genre and that we place value based off of ‘well, it’s really good for a this kind of movie.’ What does that even mean? I don’t understand. It’ll be what it is, and I think there’s going to be a lot there for people to digest and feel. Hopefully it’ll be the movie that you want to revisit again and again, and as life goes on, it’ll have more to it. I just want to make art that lasts — I want to make art that you grow with. That’s all. We heard Kelly Sue DeConnick is consulting on the movie, which is really exciting. 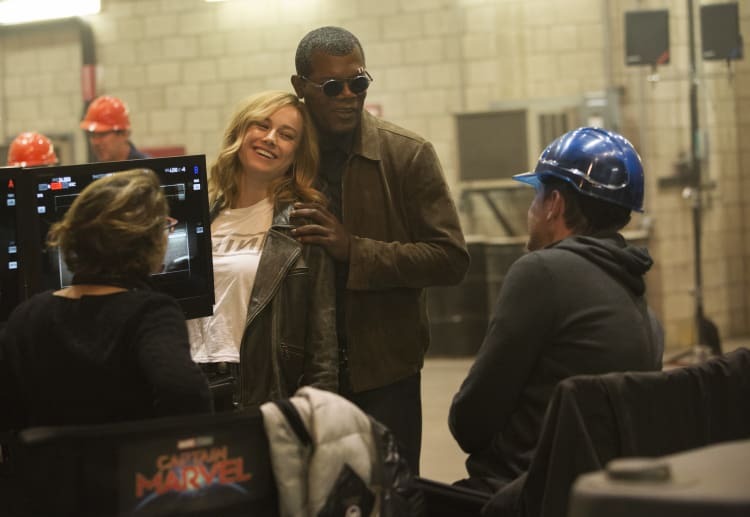 Can you share some advice or stories or just how she’s helped you get into Carol [Danvers/Captain Marvel]? I have to admit that talking to her was just so surreal. I feel like I just blacked out. I felt really nervous, because it’s this woman that she created, that I feel she knows way better than I do. I was just so honored to receive her blessing and to see how excited she was. That felt like a relief to me, because she pushed this forward. We wouldn’t be here without her, really. I’m so grateful for that character that she created, and now we’re just kind of following the breadcrumb trail that she made. Can you talk to us about the relationship between Carol and Maria? The Maria dynamic is really important in this movie. She’s like the representation of love in this film, and it’s something that I’ve very proud of, that the love relationship — and it’s a deep love relationship — is not by the same lustful definition that we attribute to movies of this size, that it’s more complex and also I think more meaningful than most love relationships that I see in films like this. Maria as a character is an incredible badass in her own way, and they are equals. I think seeing two women that have a playful competitiveness while also mutual respect and care and have gone through so much together — there’s a lot of history — and are just best friends is something that I’m excited to see. Uncomplicated female friendships are sort of rare to see. I have a lot of them in my life, so to be able to bring that on screen with Lashana [Lynch] who’s just so crazy talented and smart and beautiful and wonderful, and is doing her own part to make sure that there are revolutions in the movie that are her own, that she’s creating, is just awesome. 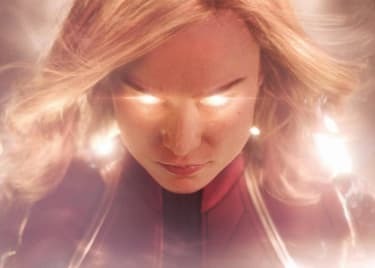 Are you excited or ready for the reaction CAPTAIN MARVEL is going to get? I’m not ready (laughs). I hope I’m not ready, because if it is something, then I want to be surprised, and I don’t want to have expectations because I’m not in it for that. I didn’t make this movie for any of those things — so that I could attach a numerical value to it. Even [the inspirational aspect] is not up to me. You don’t get to decide if you’re an inspiration to people or not. Since I agreed to do this role, people have said, ‘Oh you’ll be a role model.’ I’m just going to do what feels true to me, and if people want to tag along, they can, and if they don’t, they can bounce and that’s cool. I’m not going to go out of my way to do things in order to be something to people. All of my heroes were just unapologetically themselves, and they were flawed at times, and that’s OK. So for me, it’s part of who Carol is, too. She’s flawed. She’s not perfect. In order for me to feel comfortable stepping into this person, I have to accept my humanness and remind everybody I’m a human and I’m an artist, and I just want to make art. 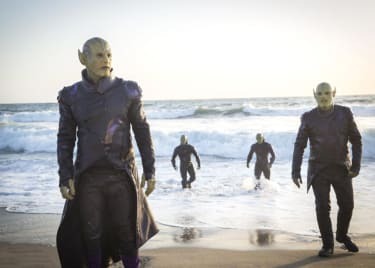 Check back on the AMC Scene often for new interviews and updates on CAPTAIN MARVEL.